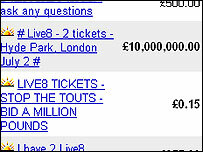 Bidders who tried to prevent the sale of Live 8 tickets on auction website eBay have had their accounts suspended. They placed bids of up to £10m for the tickets after Live 8 organiser Bob Geldof asked people to place "impossible bids" to prevent the sales. The site later decided to withdraw the sales of the 2 July concert tickets, which were won through a text contest. But those who placed high bids in the meantime were e-mailed by eBay to say they had been suspended from the site. Under eBay policy, it means they will not be able to use eBay in any way, including registering a new account. David Tilley, from Claverham, near Bristol, was one of the bidders affected. He placed a high bid and his account was frozen due to a "deliberate attempt to disrupt an auction". But at the same time he was sent an e-mail to say the tickets had been withdrawn anyway as they breached acceptable items policy. Mr Tilley told the BBC News website: "I want nothing to do with any company who rips off a charity. "The terms and conditions for the tickets quite clearly state that they are not transferable." In a statement, eBay said: "If an auction suffers hoax bidding, the seller can report this to eBay customer support and the listing can be removed. Sellers can then re-list the item for free. "Sellers can also require payment as soon as the listing ends by using our immediate payment service. "Users who place hoax bids face two warnings from eBay and are then indefinitely suspended on the third." A spokeswoman for eBay said the firm had no plans to make an exception for the Live 8 bidders, despite agreeing to remove the tickets from sale. The auction site acted on Tuesday to remove the ticket listings after "listening to customers". But earlier in the day it had insisted the reselling of charity concert tickets is not illegal under UK law, and would allow them to be sold. 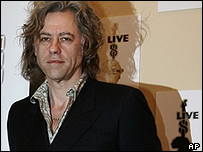 Geldof had launched an attack on the site and the sellers, calling it "sick profiteering". The Live 8 organiser called on the site to ban the tickets for next month's London show - featuring acts like Coldplay and U2 - which were won through a text competition. eBay also came under pressure from the government, with music minister James Purnell saying he "wholeheartedly" shared Geldof's annoyance. On Wednesday, Liberal Democrat culture spokesman Don Foster called on eBay to introduce a UK charity auction site.